Asp.net Hosting and Windows Hosting with IIS 8.5, Cheap ASP.NET Web Hosting, All Accounts hosted in IIS 8.5 hosting and Windows 2012 R2, AJAX, ASP.NET 4.5, .net core and SQL Reporting Services Support, MS SQL 2008 and MS SQL 2012 supported, Classic ASP Hosting, PHP Hosting and MySQL Hosting, Full LIVE CHAT 24/7 support, 99.9% uptime and 30 days money back guarantee. We are proud of our high speed connection. In fact, one of our most frequent compliments from our customers is how fast their site loads... read on and you will see why. When you combine high speed connectivity and high quality equipment, you get a fast and reliable web site. We have invested in the equipment and staff so you can rest assured that your site will load fast every time. We host sites all over the world, and with our multiple backbone connections, your customers will get through to your site fast. Read more about the network below. 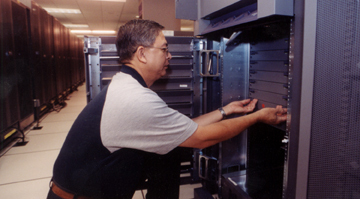 SeekDotNet currently owns and operates two state of the art data centers in Dallas, Texas, offering complete redundancy in power, HVAC, fire suppression, network connectivity, and security. With over 53,000 sq ft of raised floor between the two facilities, SeekDotNet has an offering to fit any need. The datacenter facility sits atop multiple power grids driven by TXU electric, with PowerWare UPS battery backup power and dual diesel generators onsite. Our HVAC systems are condenser units by Data Aire to provide redundancy in cooling coupled with nine managed backbone providers. Twelve more third party backbone providers are available in the building via cross connect. Fire suppression includes a pre-action dry pipe system including VESDA (Very Early Smoke Detection Apparatus) with over 700 smoke detectors between the two facilities. Every SeekDotNet server is connected to a Cisco Powered Network. Using enterprise-class Cisco networking gear, all routers, switches are tested in our testing center prior to deployment to ensure reliability and interoperability. Using multiple Tier 1 Service Providers, SeekDotNet leads the discount Web hosting industry with our 99.9% uptime guarantee, ensuring the highest degree of security against network downtime and the fastest possible data transfers. It is a common misconception that the amounts of bandwidth (size of the pipes that carry the data) differentiate web hosting companies. In reality it is not only the size of the pipes that matters, it is the utilization levels. The utilization of our Internet connections is vital to a network's ability to transfer data without packet loss or latency. SeekDotNet aims to keep all connection usage below 50% to avoid any connectivity problems. SeekDotNet runs the Border Gateway Protocol (BGP4) for best case routing. The BGP4 protocol is a standard that allows for the routing of packets of information sent out from our network. Each packet of information is evaluated and sent over the best route possible. Because of our redundant network architecture, packets may be sent via alternative routes even if they are being delivered to the same end user. Should one of our providers fail, packets leaving our network are automatically redirected through another route via a different provider.